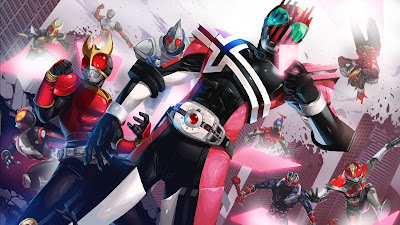 Kamen Rider ZI-O - Kamen Rider Decade To Mentor Kamen Rider ZI-O? Could this be true? The destroyer of worlds mentoring the soon-to-be demon king? Until we get a full confirmation from our regular Kamen Rider City Wars player, Filip, take this one with a grain of salt. It was also said that Masahiro Inue visited the set of Toei last month. Could this be one of the confirmation that we need for this one? 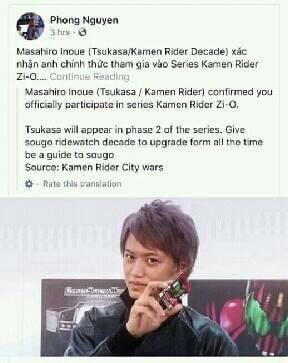 Again, let's all wait for the official confirmation and if this is really legit, this is going to be an interesting turn for the series just like Ultraman Zero mentoring Ultraman Geed. How is it possible if he's busy with Jinga? So does that mean it won't be a few episodes cameo but more like he's being a regular to the show? Jinga's been done filming for a while (not a long series at 13 eps). Eps are just in post-production (those effects take a long time to render). Zi-O's next upgrade is the Decade RideWatch that has extra features that aren't available on the rest of the Showa RideWatches. It isn't even included in the ending bumper for the show.